Over 20,000 clients trust Marshall Freeman to manage their bad debts and receivables. With 15+ years’ experience our business depends on successful collection. With 15+ years’ experience we know what works and how to get paid. Our client portal gives you instant access to manage every aspect of your account from generating no-commission reminder letters, loading new debts, monitoring debt progress and credit protection documents. What type of businesses use Marshall Freeman? More than 20,000 customers worldwide use Marshall Freeman Collections including medical, veterinary, accountants, solicitors, wholesale suppliers, automotive, engineering, clubs, childcare, video rentals, undertakers, electrical, publishing, financial, waste management, estate agents, builders, plumbers, carpenters, equipment hire in fact any business or industry that extends credit, from self employed businesses through to major corporations. How many debts can i submit for collection? During the term of your agreement, you may submit unlimited debts for collection. If you have a large volume of debts to lodge Marshall Freeman may be able to offer a bulk lodgement system depending on your circumstances. What is the minimum value debt that Marshall Freeman will collect? The minimum amount we will accept for collection is $50.00. 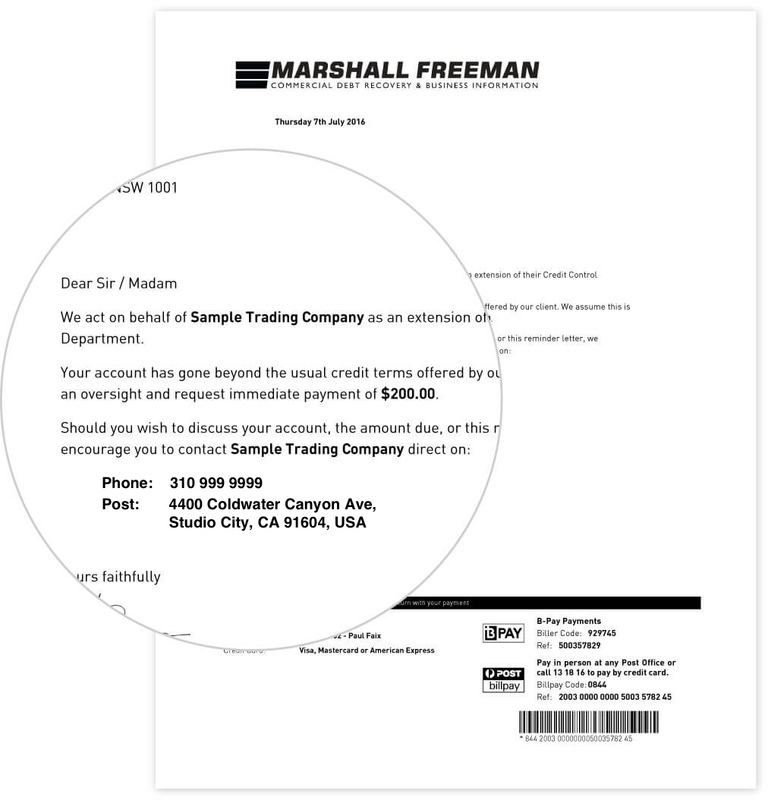 Can Marshall Freeman credit default a bad debt? Due to the Privacy Act, Marshall Freeman cannot default a bad debtor or divulge information stored on its database to a third party. Marshall Freeman recommends having solid Terms of Trade and Credit Applications with Personal & Directors Guarantees in place, as prevention is better than cure. Successful debt collection depends on a number of factors especially the age of the account. Marshall Freeman accepts debts provided local laws do not prohibit collection. As a guide debts can be pursued for 6 years although successful collection usually occurs on recently incurred debts where the debtor is traceable and solvent with no valid grounds for disputing the debt. Our experienced staff will assess each case on its merits and advise the best course of action. Do i have to pay commission if the debtor pays the account to me? Once a debt is sent for collection a debtor will often attempt to bypass us to avoid any further debt collection letters and telephone calls. Our aim is to quickly finalise accounts, once a debt is lodged, any monies paid by the debtor directly or indirectly shall be subject to commission charges. The only way you can expect to recover costs is to have proper Terms of Trade in place. Your customers need to be aware and agree that you may charge late payment fees, interest, legal and recovery costs as defined within the Terms of Trade for any accounts not paid within the agreed credit terms. How long before Marshall Freeman remits funds collected? Any monies collected in a calendar month shall normally be remitted to clients on or before the 15th of the following month. Funds are disbursed from trust accounts by EFT or cheque depending on each client's preference. What guarantee do i have that Marshall Freeman will forward my money? Due to the individual circumstances of each debt no accurate recovery time can be quoted. Our aim is to quickly identify a debtors willingness and ability to pay and then apply consistent pressure to obtain payment. We make your overdue a priority so debtors quickly understand the debt is not going away and that action will only escalate if the account is not paid. What makes Marshall Freeman different from other collection companies? A firm professional approach governs every aspect of the collection process, providing effective and realistic debt collection. Marshall Freeman is a hands on company and takes the recovery of your debts seriously. All debts are processed, computerised and administered for collection as soon as they are received. Clients can quickly obtain up to date information on their accounts via the online client service, 24 hours, 7 days a week. Read more about the online client service here. What experience has Marshall Freeman in the collections industry? What experience has Marshall Freeman in the collections industry? Over 20,000 clients internationally trust Marshall Freeman Collections to manage their bad debts and receivables, with $100 million of active debt under management our business depends on successful collection. Marshall Freeman Collections carefully selects motivated, experienced debt collectors who demonstrate knowledge of the credit industry and can resolve disputes, track down skipped debtors, monitor promised payments and be successful in making lawful demand for payment. What kind of references/testimonials can Marshall Freeman provide? Marshall Freeman can provide references on request from clients who have agreed to confirm the effectiveness of our collection service. Please understand we are bound to strict client confidentiality and cannot discuss individual client files. Trusted by 20,000+ companies worldwide.